The name “Copt” is derived from the ancient Greek name of Egypt “Aigyptus” which is written with an “Epsilon”. If the prefix and the suffix are removed, the stem “Gypt” remains and is transformed into “Copt” in modern language. 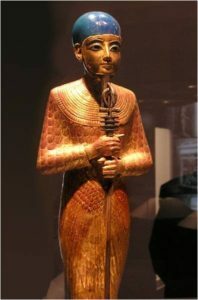 So the name Egypt as it is Hellenic, is believed to be derived from Ha-Ku-Ptah, the sacred appellation of Memphis the capital in the ancient hieroglyphic language of Egypt. 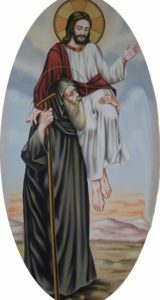 The Coptic Church was the first to start monastic movement in all its forms and it is well known for her numerous saints: ascetics, clergymen and laymen. She offered many saints throughout the ages and is still offering the same today. The church believes that practicing the sanctified life and communion with God, the Holy One, is prior to satisfying minds with solid mental studies. Who Founded the Coptic Church? The Coptic Orthodox Church was founded by St. Mark, one of the seventy Apostles (Mark 10:10) and one of the four Evangelists. The church is known as the Church of Alexandria and it is called the “See of St. Mark”. It is one of the earliest four sees: Jerusalem, Antioch, Alexandria, and Rome. St. Mark is regarded by the Coptic hierarchy as the first of their unbroken 118 patriarchs, and also the first of a stream of Egyptian martyrs. St. Mark was a broad-minded Apostle. His ministry was quite productive and covered large field of activities including: (i) preaching in Egypt, Pentapolis, Judea, Asia Minor, and Italy during which time he ordained bishops, priests, and deacons, (ii) establishing the “School of Alexandria” which defended Christianity against philosophical school of Alexandria, and (iii) conceived a large number of great Fathers, and writing the Liturgy of the Holy Eucharist which was modified later by St. Cyril to the liturgy known today as the Liturgy of St. Cyril. The Coptic Church has kept all the practices as set by the Apostles and the earlier fathers of the Church, e.g., liturgies, order of prayers, rites, and all aspects of the early Apostolic Church without any variation. The British historian Butler wrote in the preface of his book about the old Coptic churches saying “no fair and an unbiased person concerned with the teachings of the early church can compare between the order of our Western church today and the order of a church that has undergone no changes like the Coptic Church, without regretting the desertion of its rites and dogmas”. The Coptic Orthodox Church believes that the Holy Trinity: God The Father, God The Son, and God The Holy Spirit, are equal to each other in one unity (Deut 6:4, Isaiah 44:6-8, 1Cor 8:5-6, Matt 28:19, 1John 5:7, Matt 3:16-17); and that the Lord Jesus Christ is the only Savior of the world. Little change has taken place in the Coptic Church than in any other church whether in the ritual or doctrine aspects and that the succession of the Coptic Patriarchs, Bishops, priests and Deacons has been continuous. The Coptic Orthodox Church also believes in seven holy sacraments exercised by the fathers of the church (priests) who have been ordained by the prayers and the placing of hand of their bishops on them. They are unseen blessings given to the believers under seen signs and they have their utmost importance since they are necessary for the salvation and the receiving of the benefits of the Holy Spirit. These sacraments are: Baptism, Al-Myron (The Holy Chrism), Confession, Communion, Anointing of the Sick, Marriage, and Priesthood. We believe in one God, God the Father, the Pantocrator, creator of heaven and earth, and of all things seen and unseen. We believe in one Lord, Jesus Christ, the only-begotten Son of God, begotten of the Father before all ages. Light of Light, true God of true God; begotten, not created; of one essence with the Father by whom all things were made; Who for us men and for our salvation came down from heaven, and was incarnate of the Holy Spirit and of the Virgin Mary, and became man. And He was crucified for us under Pontius Pilate, suffered and was buried; and on the third day He rose from the dead according to the Scriptures. He ascended into the heavens and sat at the right hand of His Father; and He is coming again in His glory to judge the living and the dead; whose kingdom shall have no end. Yes, we believe in the Holy Spirit, the Lord, the Giver of Life, who proceeds from the Father; who, with the Father and the Son, is worshiped and glorified; who spoke by the prophets. And in one holy, catholic (universal), and apostolic Church. We confess one Baptism, for the remission of sins. We look for the resurrection of the dead, and the life of the age to come. Amen. At age twenty, St. Bishoy joined the monastery of Scetis. His spiritual father was the Great St. Bemwa. St. Bishoy was very alert over his ascetic life: praying constantly, fasting for long periods, and learning the holy books by heart. It was said that he loved to read the book of Jeremiah, and that the prophet himself used to appear to him and explain what was hard to understand. St. Bishoy’s sweet aroma diffused and filled the wilderness. As a result, multitudes of monks flocked to him seeking his teaching and advice. He became the father of approximately eight thousand monks. He taught them the fear of God, and implanted into their souls the spirit of meekness which is the essence of the spiritual life. The monks knew about the Lord’s appearances to St. Bishoy. One day, they asked him to plead to the Lord on their behalf, so that He might bless them with such an appearance. When St. Bishoy saw their eagerness, he mentioned to the Lord their desire, and pleaded for them saying that such an appearance would increase their enthusiasm and encourage them in their spiritual life. The Lord promised to appear to them on the mountain on a certain day at a certain time. On the appointed day, early in the morning, all the monks raced to reach the mountain as early as possible. It happened that St. Bishoy, being a fairly old man, was walking at the end. He saw an old man who looked too weak to walk. St. Bishoy stopped and asked him where he wanted to go. When he learned that He wanted to go to the same mountain, he had pity on Him, and offered to carry Him. The old man refused at first, but agreed when St. Bishoy insisted. St. Bishoy continued his journey to the mountain where he saw all the monks waiting with eagerness to see the Lord. Their disappointment came when St. Bishoy told them that the Lord had already appeared, and that they had all seen Him, but having closed their hearts they did not recognize Him. One of St. Bishoy’s noble traits was his hospitality to the strangers. One day while he was sitting outside his cell, he saw a stranger weary from walking. He stood up and invited the stranger to his cell. Then he got a basin, filled it with water, and insisted on washing the stranger’s feet. While washing His feet, he heard the Lord’s voice saying, “My chosen Bishoy! You are an honorable man.” Realizing that he was washing the Lord’s feet, he knelt down and worshipped Him. The Lord gave him peace and comforted him. There was an aged monk living in a town called Epsi in Upper Egypt. Misled by the devil, he deviated from the Orthodox belief, denied the existence of the Holy Spirit, and started to spread his heresy openly. As God wanted to save him, he disclosed his case to St. Bishoy. St. Bishoy made some baskets with three handles each, and set off to the place where that monk was. When he arrived there, the old monk welcomed him with great hospitality. The other monks in the area gathered around him to receive his blessing. The three handles of the baskets attracted their attention and they asked the meaning of it. St. Bishoy answered, “I always do my manual work after the example of the Holy Trinity.” On hearing this, all the monks exclaimed, “So Father, there is a Holy Spirit!” The saint started to teach them about the Holy Spirit, the Third Person of the Holy Trinity. As he quoted many verses from the Scriptures, they all believed and professed their faith in the Holy Spirit. After the Barbarians attacked Scetis, St. Bishoy went to Ansena in Upper Egypt. There he met a spiritual friend called St. Paul El-Tamouhi. The strong spiritual bond between them was blessed by the Lord. St. Paul saw a vision and heard the Divine Voice promising that their bodies will always be together. On July 15, 417 AD, St. Bishoy commended his soul in the hands of his Savior. Three months later St. Paul El-Tamouhi died also and his body was buried beside St. Bishoy. In 842 AD, the two bodies were moved to Scetis, desert of Egypt, where they rested there till today.